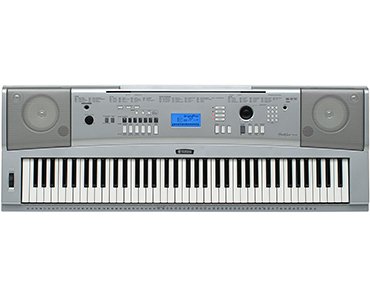 The primary purpose of this article is to serve as a Yamaha DGX 230 keyboard review. Our article is going to attempt to cover the main features of the product and will also focus on any relevant pros and cons that we find. In addition, the article will also summarize the main points we found in both positive and negative user opinions of the product. At the end of the article, we will summarize our findings and offer a final recommendation for the product. Kicking off our Yamaha DGX 230 keyboard review is our section on the keyboard’s responsiveness and design. As soon as you press down on one of the keys, the first thing you will notice is that the keys have a slight amount of pressure under them. We are talking about Graded Soft Touch. Graded Soft Touch is a type of technology that utilizes rubberized backings under the keys to create a more traditional feel that you would find in standard pianos. 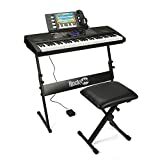 For users that are switching back and forth from a piano to an electronic keyboard at home, this is a great benefit. The total key count for the keyboard is an impressive 76 keys. This gives you approximately six different octaves to choose from and greatly expands the range of musical pieces that you can play. One of the main things that we felt was worth mentioning in our Yamaha DGX 230 keyboard review is the wide selection of instrument choices that it offers. Combining natural voices, accompaniments, and regular instruments, this keyboard boasts an impressive 489 different sounds to choose from. When it comes to selecting the instrument that you want, the manufacturers made sure that it was as easy as possible. 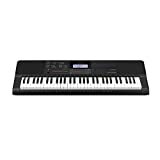 The keyboard utilizes a bright blue LCD display that lets you see what instrument you have currently selected. Along the top of the keyboard is where the numbers are located that correspond to the various available instrument choices. This part of our Yamaha DGX 230 keyboard review is going to focus on the overall sound quality that the speakers offer. On the top left and right of the keyboard is where you will find both speakers. The larger speakers each measure 5 inches across while the smaller ones on the inside measure 1 inch. Overall, the sound quality produced by these speakers is perfect for medium venues. For larger rooms, you may want to consider investing in an external amp instead. However, most users will be more than satisfied with the bold and rich sound quality that these speakers provide. 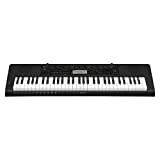 The ability to access and use the Yamaha Educational Suite is another huge benefit that this keyboard has. 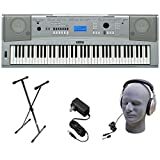 The keyboard comes with a wide range of prerecorded songs that are stored on the internal memory. You can select from just left-handed practice, right-handed or both before starting the song of your choice. For new and inexperienced users, this is a huge benefit for practicing at home. To enhance your experience, you can always download additional material from Yamaha to further challenge yourself as your skills progress. 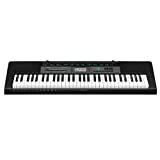 Another area where the Yamaha DGX 230 keyboard shines is in its versatile power source options. For on the go fun, you can rely on battery power using six D size batteries. For more continuous operation, you can plug into a standard wall outlet using the DC power adapter. Just keep in mind that this adapter is typically absent from the main keyboard package. Offers an impressive selection of 489 different instrument and accompaniment choices. DC power adapter is sold separately. Can be operated via battery or wall outlet. 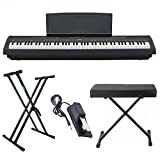 Additional song choices and educational tools are sold separately via Yamaha. LCD display makes it easy to see which instrument and song you have selected. Keys are only semi-weighted. Educational tools like the Yamaha Educational Suite are incorporated into the design. Sound quality carries well in a wide range of room sizes. Fairly priced for the number of instruments and features that it provides. 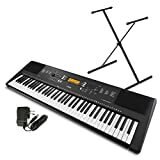 In this portion of our Yamaha DGX 230 keyboard review, we’re going to attempt to summarize the main points users made in both their positive and negative reviews. Starting with the positives, most people seem to love the wide range of instrument and voice selections that this product offers. Another positive point that users made is that this product is quite affordable for the number of instruments and features that it supports. Overall, most users seem to be more than satisfied with their purchase. However, there were a few negative points as well. One of the complaints some users have is that the keyboard doesn’t utilize a fully weighted key design. This is mainly a problem for users who are more accustomed to a traditional piano. While semi-weighted keys help simulate the feel, they’re still not as effective as a fully weighted keyboard design. After a lengthy review of the findings in our Yamaha DGX 230 keyboard review, we feel that the keyboard is an excellent choice for many reasons. 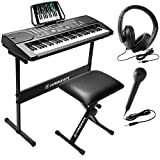 For starters, it offers a huge amount of instrument and voice choices. We also feel that the semi-weighted key design is a good compromise that helps to emulate the look and feel of a traditional piano. We strongly encourage you to give it a try yourself. Once you’ve had the chance to experience what it has to offer, feel free to share your thoughts in the comments section.